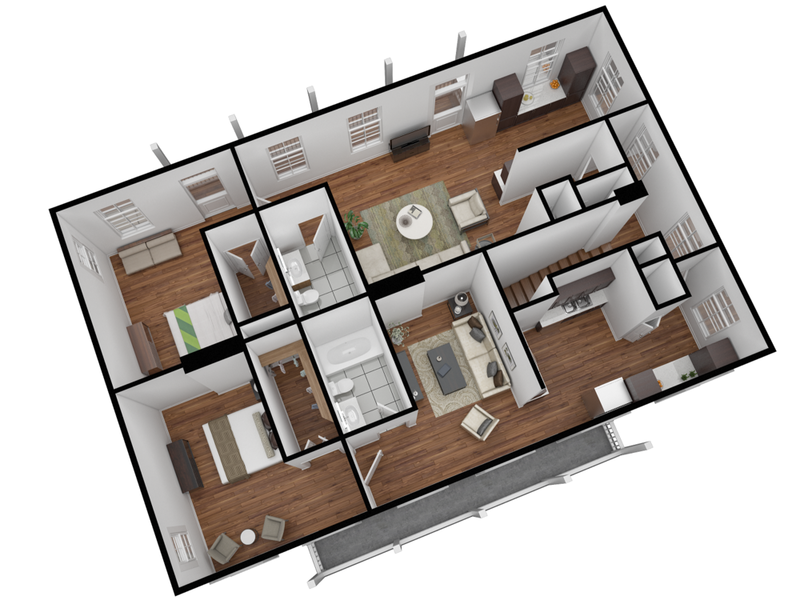 A modern apartment's 3D floor-plan rendering, viewed from the top. 3D floor plan renderings are a great way to visualize the interior spaces of your proposed development. Whether it's residential, commercial or industrial our 3D floor layout rendering services will help bring a new dimension to your architectural projects, whether you're developing a one bedroom apartment, four bedroom home, condominium complex, or even the reception area of an office, the layout of a commercial building, or auditorium of an institution. By using our 3D rendering company to lay out your floor allocation, you can create a model that is as close to the real thing as you can get before construction and renovating begins. You will easily be able to see the size of each room, the flow of space throughout the building and where all your furniture might fit. You can plan the room and other rooms taking into account the entry and exit points as well as the position of each window. This is helpful no matter if you are starting new construction or working on renovating an existing structure. 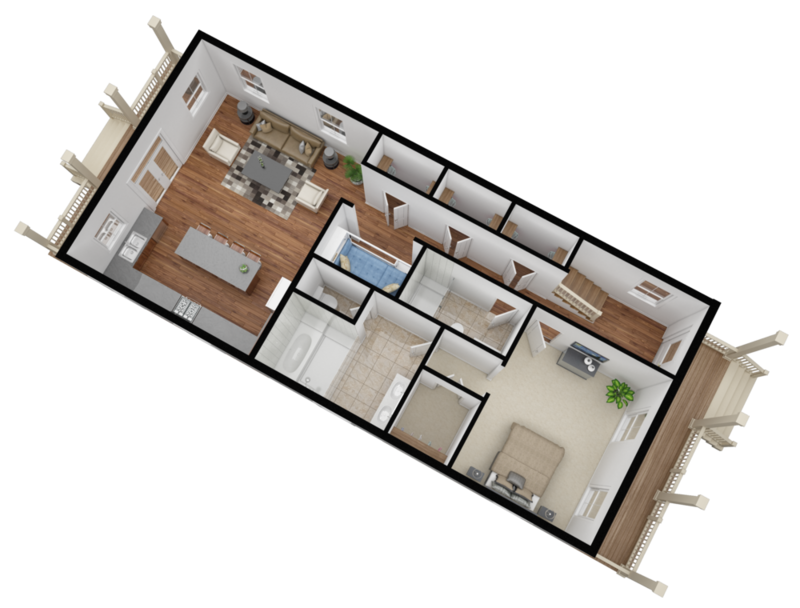 A rendered 3D floorplan will help you to determine the size of furniture that you can purchase and how much you can really fit into one room (it might be more or less than you think!). You won’t have to try to imagine the spatial relations in each room by looking at a flat drawing, you can feel as if you are in the room when you look through a 3D rendering. Many clients have utilized our quick and affordable 3D rendering services in their projects to lay out plans for modern apartments, four bedroom houses, hotels and other commercial, residential, and office buildings. To see some of our previous work here's our portfolio video. Who can make Use of Our Floor Plan Rendering services? Visualizing your architectural project with a 3D floor layout prior to beginning construction is a great way to ensure the space will work the way you intend it to. Visualization services will help you catch any inconsistencies or oversights in the design prior to any substantial investments in the project. Having an accurate model to reference when beginning construction will help you and your team be more efficient and make less mistakes. Our rendered floor plan services will allow you to look at a live model of your floor space setup, and let you see more easily if you have elements that just won’t work so that you can correct them and save money, materials, and time. 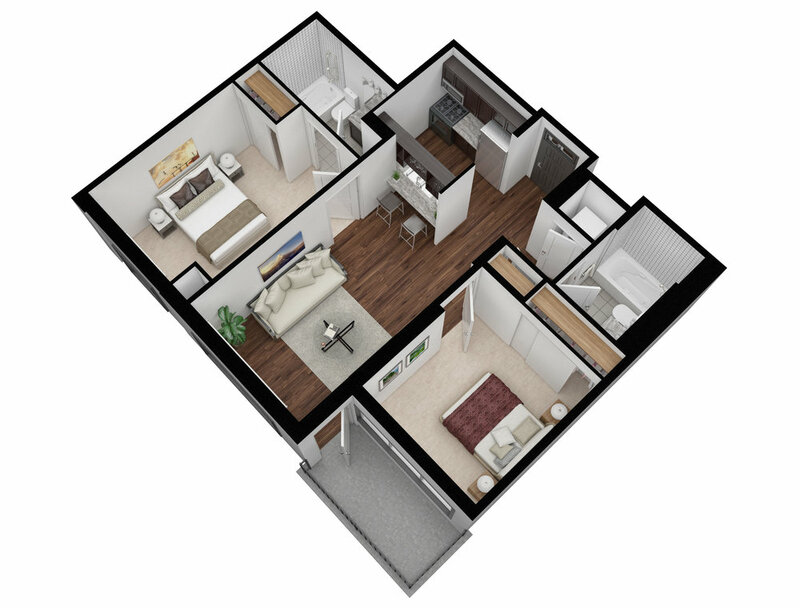 A 3D floor arrangement rendering is also a great way to engage prospective investors, clients, purchasers, developers, or tenants and will help you secure commitments upfront. 2D drawings, reports, and presentations just aren’t effective anymore. People need to see your vision as you see it and the 3D modelling services that we offer will let them do just that. The only thing we require for our floorplan rendering services are the architectural drawings, sketches or blueprints, in any format (CAD, PDF, JPG, PNG or GIF) and all the information you can provide about the intended function of each space, as well as any preferences on the layouts. If you still aren’t sure about the final layout of the space, we can offer some proposals on layouts and creative furniture and appliance allocations that look great, after taking into account all of the guidelines you provided. You will get one floor plan for each floor, office or apartment that is part of the project, as you request. Our experts can help you create 3D models of existing plans or construct them anew for any construction project so that your work is well thought out and planned ahead of time. To get a free no-obligation quote call us at (1-877-350-3490) or request an quote now using the button below.